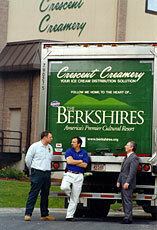 As a locally owned Company, Crescent Creamery understands the importance of community support. We live, work and play here. Our children go to school here. We are part of the community and we realize that our success depends greatly on the health and vitality of the cities and towns where we live and do business. On an annual basis, Crescent Creamery supports countless agencies, schools and community service organizations in the form of cash donations, event sponsorships and in-kind gifts. Our management team has taken leadership roles in many community organizations including the Berkshire United Way, Rotary Club of Pittsfield, Gladys Allen Brigham Center, Great Trails Council, Pittsfield Youth Council and the Berkshire Regional Employment Board. Crescent Creamery employees share our commitment to the community. We are United Way Pacesetters and our employees have earned 100% participation for nearly 20 consecutive years. Incredibly, nearly 40% of our staff are Greylock Society Members, a Leadership Level of Giving recognized by the Berkshire United Way. At Crescent Creamery, it's not just about Quality Milk for Particular People, it's also about quality of life, for all of us! At Crescent Creamery . . . we put your milk money to work in support of our community!